New signing Gadwin Springer believes it was too good an opportunity to miss when he was given the chance to come to England to play for Castleford Tigers. The 22-year-old prop or second row forward from French Guiana signed on a two-and-a-half year deal from Catalans Dragons and is aiming to make the most of his opportunity to make it in the game over here. French junior international Springer has made three appearances for the Dragons this year, including playing against Castleford at the Mend-A-Hose Jungle, and he is looking forward to running out in front of the Tigers fans again, this time in a home shirt. He explained how the move came about: “The coach (Daryl Powell) spoke with my agent and said Cas was interested. I was happy because I know Cas is a good team. “I always said that if I had the chance to come and play in England I wanted to come because I know it is a good experience to play over here. “I said to the (Catalans) coach it was a good opportunity for me to come here. He was not very happy, but I said I wanted the experience. 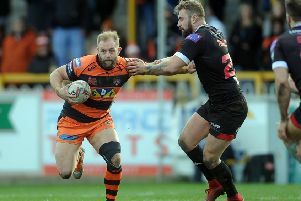 Springer revealed he had an unusual background for a Rugby League player, having been born and initially raised in French Guiana before moving to France in 2005 when he was 12. He played the sport for the first time at Toulouse before a spell with St Esteve and then getting his big break with Catalans, for who he made his Super League debut last year. Tigers head coach Daryl Powell thinks his first new recruit for the 2016 squad is a top prospect. He said: “He’s signed a two-and-a-half year contract here so we’re pretty excited about Gadwin as a player. “I’ve seen him play a few times off the bench for Catalans and he’s a handful. “I only expect him to get better, he’s young. When you look at the youth in our pack the potential moving forward is incredible. “It’s only this season he’s come to my attention. I watched him play against Hull KR first up and saw the energy he played with. “Physically he’s a good specimen and he’s going to get better in that regard. “The try he scored against Hull KR showed a fair bit of strength and ability. I thought he was really good against us when he played here as well so I’m delighted we’ve been able to sign him. Springer will not go straight into the first team, but he is expected to be in contention once the coaching staff have had the chance to assess him. Powell added: “I’m not certain when he will be in the first team. He’s only just got here and I’ll have a chat with him and we’ll work from there. “We’ve got this week and then we’ve got a week when we don’t play. We can have a look at Gadwin and he can have a good look at us and we’ll see how quickly he fits into what we do.